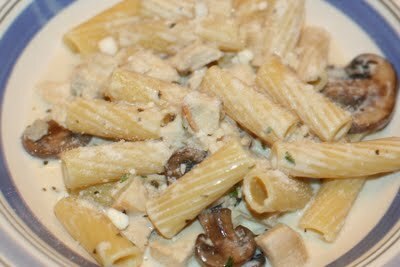 My week’s recipe came from Christina over at Tales from the Mad Men Kitchen, and it was her Rigatoni di Gregorio. The recipe I submitted was (obviously) my family’s Lemon Chicken. The recipe was easy and so delicious, but neither of my kids would eat it! Both of my girl’s who LOVED mushrooms in the earlier years of their lives have suddenly boycotted them! Now they won’t eat anything in the same room as a mushroom….it’s a shame, really! But Joe and I enjoyed it! I had to tweak the recipe also b/c I thought I had Marsala wine and I did not….it was red wine! So I had to take that out of the recipe, but it was still very, very good! Thanks, Christina!!!! Directions: Bring a pot of water to a boil. Once boiling, cook pasta according to package directions. Drain well. Meanwhile, heat 1 tablespoon of olive oil in a large skillet over medium-high heat. Add the chicken breasts to the pan and cook, turning once, until golden brown on both sides and cooked through, about 7-10mins (Christina said hers took 5-7, but I think my cutlets were thicker). If necessary, turn down the heat to medium-low so the outside doesn’t brown too quickly. Remove the chicken to a plate and set aside. When cool enough to handle, cut into bite-size pieces. Add the remaining 1 tablespoon of olive oil to the pan with the heat on medium-high. Add the onion to the pan and cook, stirring occasionally, about 2 minutes. Add the mushrooms to the pan and continue to cook until most of the liquid has been released and the onions are softened, about 5 minutes more. Mix in the garlic and sauté just until fragrant, about 30 seconds. Remove the pan from the heat and add the wines, scraping with a spoon to deglaze the browned bits from the bottom of the pan. Whisk in the chicken broth. Return Bring to a simmer, lower the heat to medium and continue to simmer until the liquid is reduced by about half. Stir in the cream and cook until heated through. Add in the herbs, Parmesan and butter; mix until well blended and the butter is completely melted. Add the cooked rigatoni to the pan and toss with the sauce. Serve immediately with additional grated Parmesan as desired. ENJOY!!! !